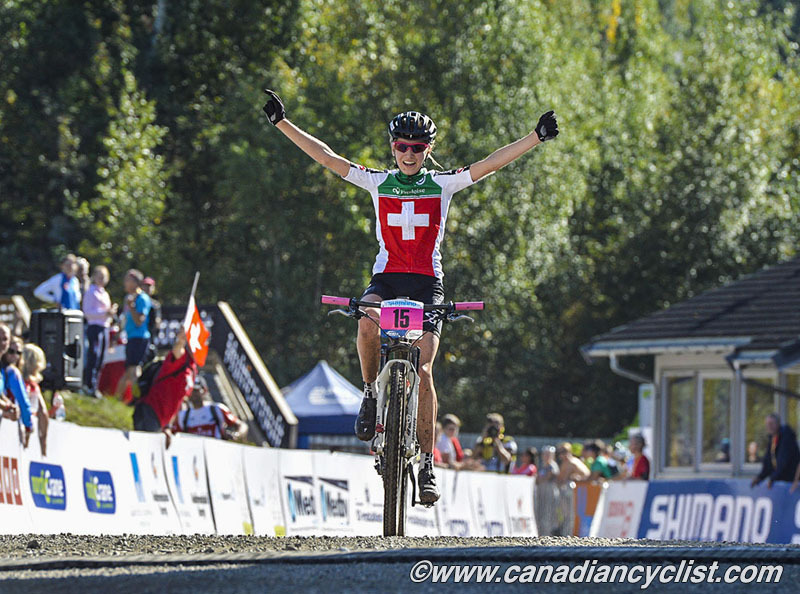 The first day of cross-country racing at the UCI Mountain Bike & Trials World Championships in Hafjell, Norway, saw two champions awarded the rainbow jersey, with Nicole Koller of Switzerland winning the Junior Women's title and Simon Andreassen of Denmark the Junior Men's. 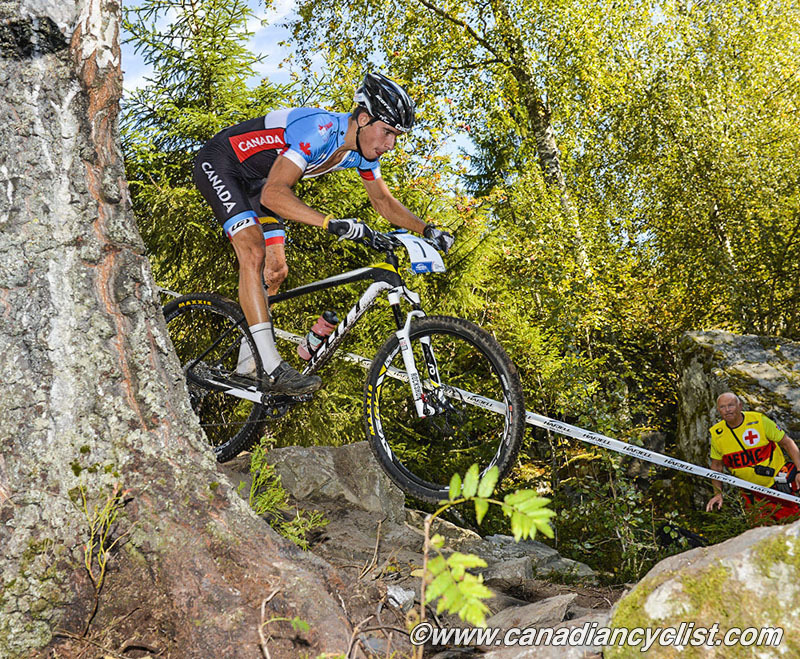 Canada had a pair of 12th places, with Marine Lewis for the women and Marc-Andre Fortier for the men. For the third day in a row, weather conditions were perfect, with sunny skies and warm temperatures showcasing the Norwegian countryside. In the women's four lap race, Malene Degn of Denmark opened a ten second gap on the Swiss duo of Koller and Sina Frei in the first lap. She managed to hold onto the lead until the halfway point in the race before Koller bridged up in the third lap. The two rode together for the beginning of the final lap before Koller pulled away on the climbs to win decisively, by over a minute. Frei hung on for third. 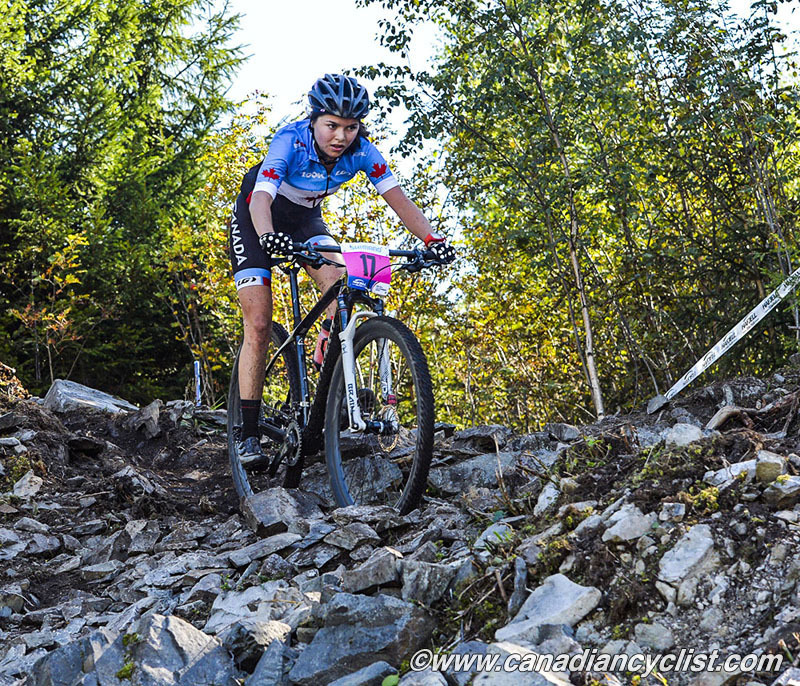 National champion Soren Meeuwisse was riding a few spots behind Lewis until she crashed in the second half of the race, eventually finishing 28th, just ahead of Laurie Arseneault, with Paige Foxcroft finishing 36th. "For the first part of the race I was further back, and I had to fight to get to Malene," explained Koller. "Then we rode together until the last lap, when I realized that I had got a little gap. When I heard that it was 30 seconds then I just had to be careful not to crash or have any problems." The men's race was decided in the first lap of the five lap race, when Andreassen rode away from the rest of the field with an impressive display of power and skill. By the end of the first lap he had a 30 gap on Egan Bernal (Colombia) and Hugo Pigeon (France), and it continued to grow. Pigeon fell off the pace and Bernal was eventually joined by Luca Schwarzbauer (Germany), but the duo could make no dent in Andreassen's lead. 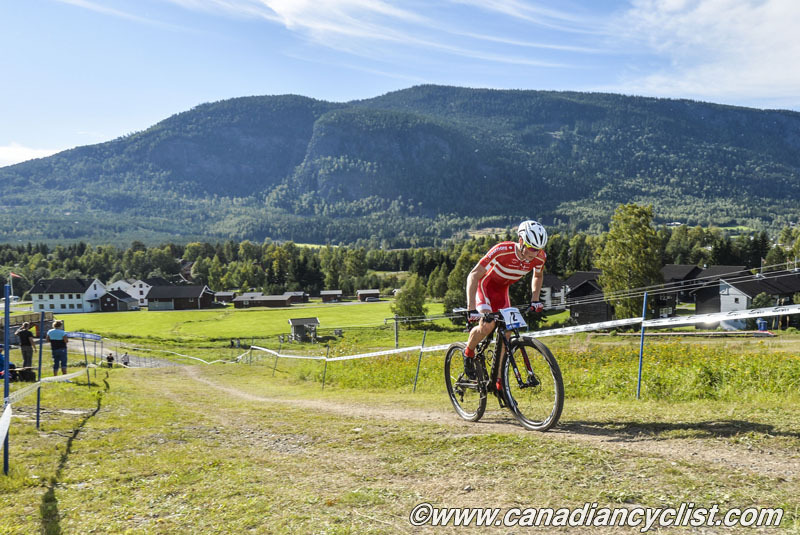 The Danish rider finally slowed in the last lap when a slow leak forced him to be cautious on the descents and technical sections. However, he still rolled in 37 seconds ahead of Bernal, who outsprinted Schwarzbauer for the silver medal. "It was a very great day," said Andreassen. "I felt perfect, and it was my biggest goal for the season, so I'm very happy to complete it. I felt a lot of pressure, because I have won a lot of races this year, so people were expecting me to be fast today. But I felt good before the race so I was ready to give it my best." Rhys Verner finished 41st, Felix Belhumeur 53rd, Felix Burke 69th and Guillaume Larose-Gingras 70th.